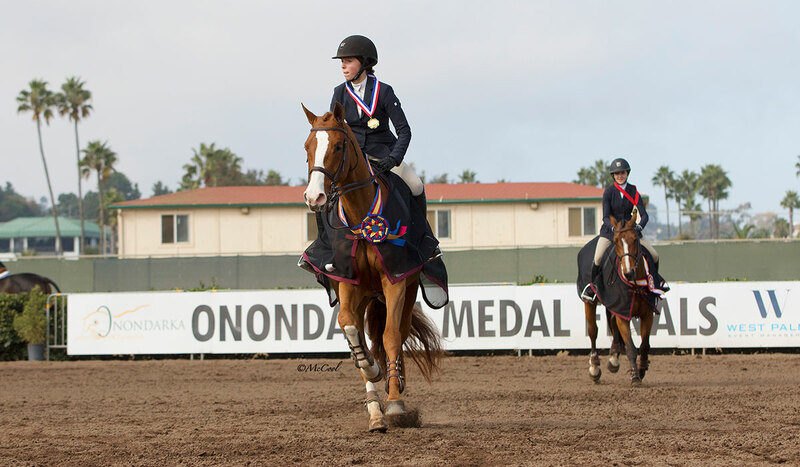 DEL MAR—The Del Mar International swept through the Del Mar Fairgrounds three consecutive weekends in October, showcasing a spectrum of talent vying for series awards and medal finals. One of the highlights was the Oct. 21 $25,000 GGT Footing Grand Prix Series Final, presented by California Horsetrader and horsetrader.com. Eduardo Mendes took the final, but Kristiin Hardin ended the year as the GGT Series CHampions. Menezes couldn’t say enough good things about the 15-year-old chestnut Warmblood gelding owned by Carlos Hank. Coming in second was Mandy Porter on Pasilla, an 11-year-old grey Swedish Warmblood mare owned by Sarah Ballou. 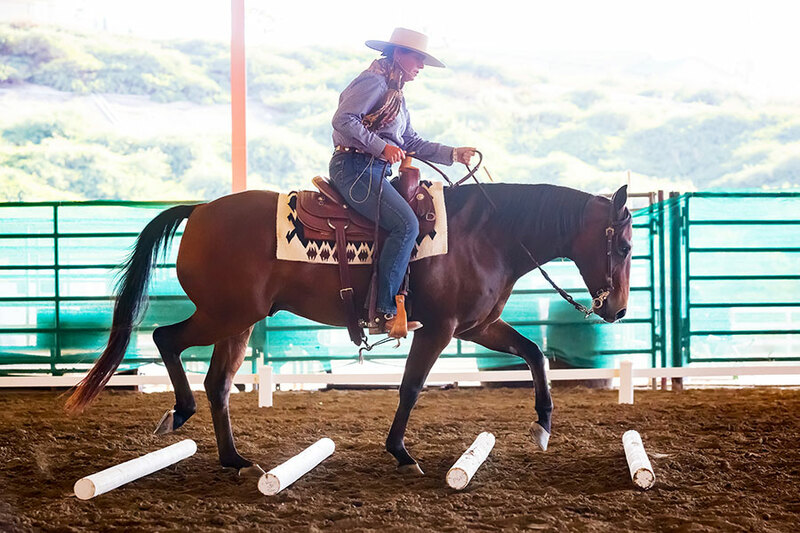 NORCO—From the mounted shooting to carriage driving—and everything in-between, it seemed—the Second Annual Norco Horse Affair brought Ingalls Park Equestrian Center to life Oct. 5-7. Presented by The Thrifty Horse Consignment Shoppe, the event drew attendees from throughout Southern California to enjoy three days of seminars, entertainment and shopping the wares of more than 35 vendors. 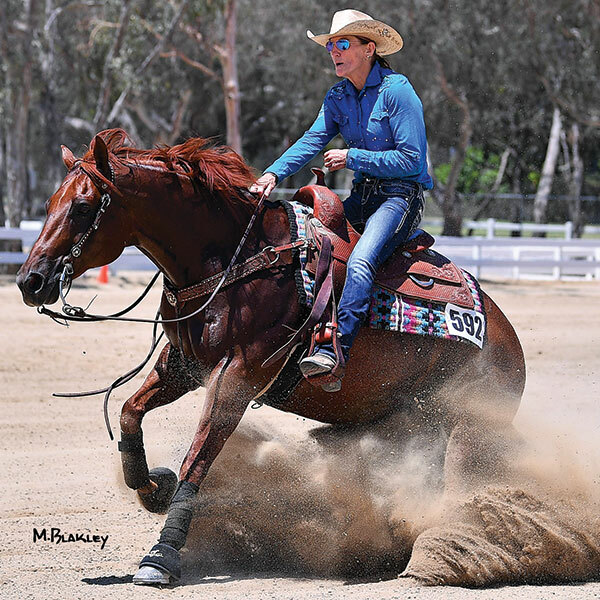 Clayton Edsall was a star at the NSHA Futurity, Derby and World’s Richest event in Las Vegas Aug. 21-26, taking Metallic Train to the Open Hackamore Championship and Bet Hesa Boon (pictured) to the Open Derby title. Combined, the wins earned $11,235. Both horses are owned by Beverly Vaughn. 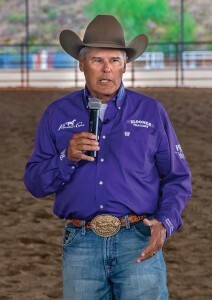 LAS VEGAS, Nev.—If what goes over well in ‘Vegas, stays in `Vegas, than the National Stock Horse Association’s Snaffle Bit Futurity, Derby and World’s Richest Bridle competition has found a new home. In the Protect The Harvest-sponsored Open Futurity, Justin Wright shined, finishing with four horses in the money and racking up about $42,500. 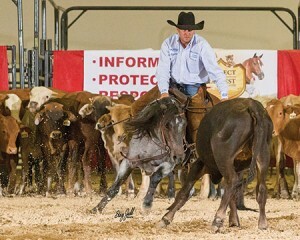 He claimed $27,055 for his championship finish on Eric Frietas’s Scooter Kat, a son of National Cutting Horse Association (NCHA) Open World Champion Kit Kat Sugar out of Scooters Daisy Dukes, a mare by Dual Smart Rey that earned $93,217 in the cutting pen. Reserve Champions Phillip Ralls on Lil Time Reymanising (One Time Pepto x Reymanising) were 5.5 points back in the composite score and earned $16,378 for owner Holy Cow Performance Horses. Wright also earned Open Futurity money on Dan Heath’s Smokum Every Time (third place tie; $9,827), Mark and Kim Rauch’s One Sparkling Time (10th place tie; $4,397) and Bill Stevenson’s Metallic Flame (16th place; $1,213). Justin Wright celebrates his $35,000 victory Sept. 16 in the Reno Snaffle Bit Futurity Open along with friends after scoring a composite 662.5 on Metallic Flame, owned by Bob Stevenson of Buellton. RENO, Nev.—The tradition of the reined cow horse sport on the West Coast continued with the Second Annual Reno Snaffle Bit Futurity, presented by Lucas Oil and Protect The Harvest, held Sept. 10-16 at the Reno-Sparks Livestock Events Center. Highlights of the futurity included the crowning of Metallic Flame and Justin Wright as the Open Futurity champions, Got Kisses and Laurie Richards taking home the Non Pro Futurity championship titl, the continued tradition of Reno Snaffle Bit Sales held in conjunction with the futurity, the new addition of the Wild Spayed Filly Futurity competition (which Lance Johnston and Three Fingers Holly dominated), and plenty of shopping with the western vendors located along the concourse. 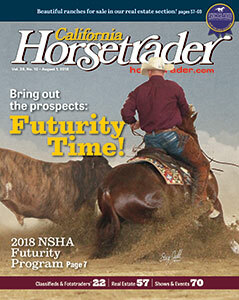 “Our entries were up from 2017 in the futurity divisions and horse show classes, and we are amazed at the remarkable support we’ve received from the reined cow horse world,” said John Ward of Tulare, and one of the founders of the Reno Snaffle Bit Futurity. 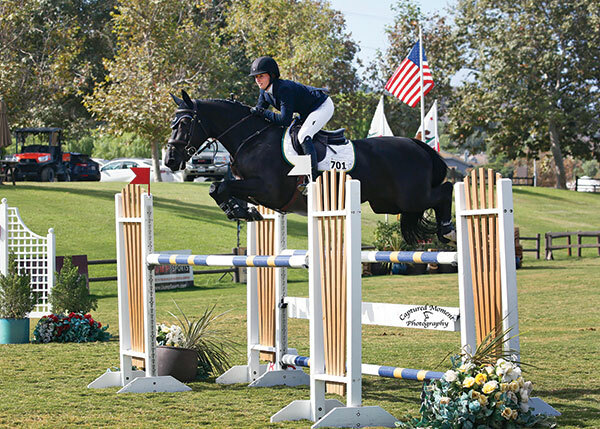 Quentin VA and Susan Artes take the 5-year-old win at the Sept. 20-23 YJC Regionals in San Juan Capistrano. 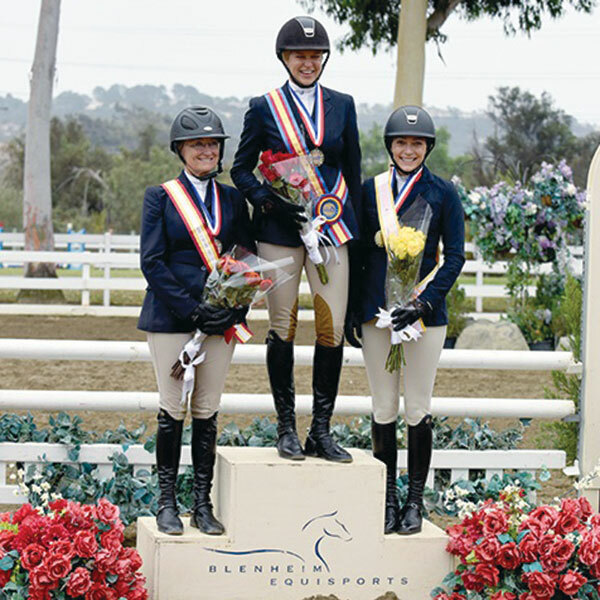 SAN JUAN CAPISTRANO—As the 2018 outdoor season comes to a close, Blenheim EquiSports welcomed the horses and riders who have prepared for the Young Jumper Championships throughout the year. About 50 young horses from ages four to seven competed on the grass of The Oaks International Grand Prix Field Sept. 23 in this year’s YJC Western Regional Finals, presented by Electronic Vet, during the International Jumping Festival. Many of the future equine stars qualified through competing in young jumper classes for free at Blenheim EquiSports. 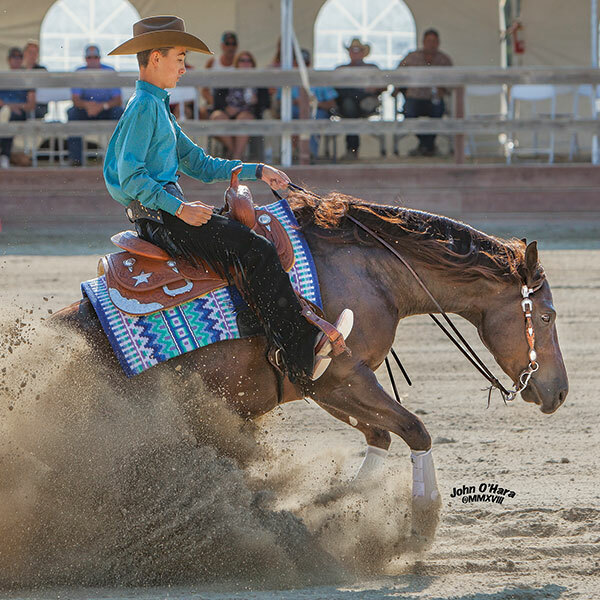 A group of six wide-eyed and wonderful 4-year-olds competed on The Oaks International Grand Prix Field in their division of the Futurity Regionals. With a flat phase and jumping course on Wednesday, and a full course over slightly larger obstacles on Thursday, the youngsters were judged on rideability, jumping scope, technique, and movement. Two experienced horsemen, Will Simpson and Jason McArdle, adjudicated. U.S. bred C Everest (Cancara Z x Diamond Dancer by Blue Diamond), with rider and owner Kristina Cain, remained consistent over the two days to take home a well-deserved victory. 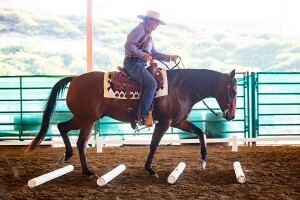 LAS VEGAS, Nev.—There’s deeply rooted tradition in the discipline of reined cow horse, and the horsemen and horsewomen preparing for fall aged events will surely abide by the time-honored techniques and practices that make this sport so beloved. 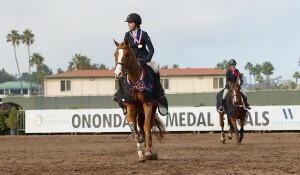 But innovation surrounds the events that showcase these horses, and no one has been more leading-edge than the National Stock Horse Association, which is moving its signature event from Paso Robles to Las Vegas this year. South Point Hotel and Casino, designed and built with equestrians in mind, will host the 2018 NSHA Futurity, Derby and World’s Richest Stock Horse competition Aug. 21-26. 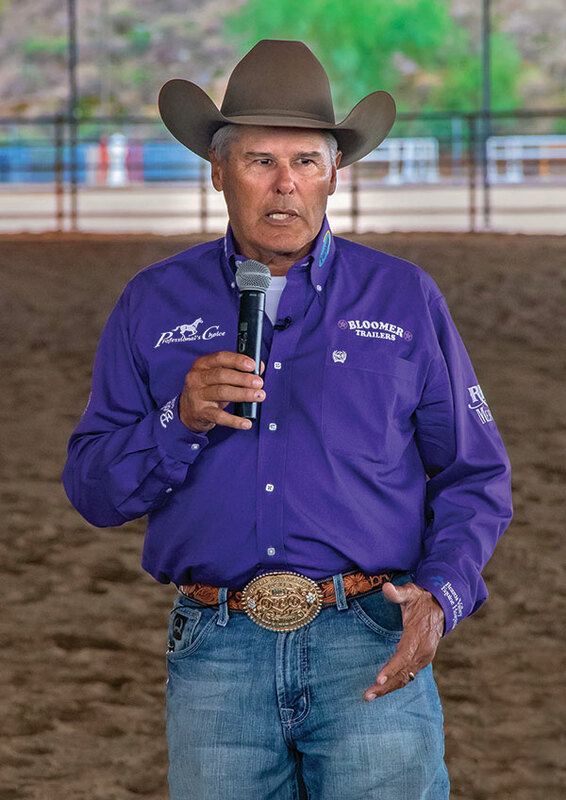 It will be the first time this event, which began decades ago as a summer coming out party for trainers to show their 3-year-old prospects before the venerable National Reined Cow Horse Association Snaffle Bit Futurity, takes place outside California—the cradle of reined cow horse. The NRCHA moved its World Championship Snaffle Bit Futurity to Fort Worth, Texas, last year.